Drenpa Namkha (Tib. དྲན་པ་ནམ་མཁའ་, Wyl. dran pa nam mkha' ; Skt. 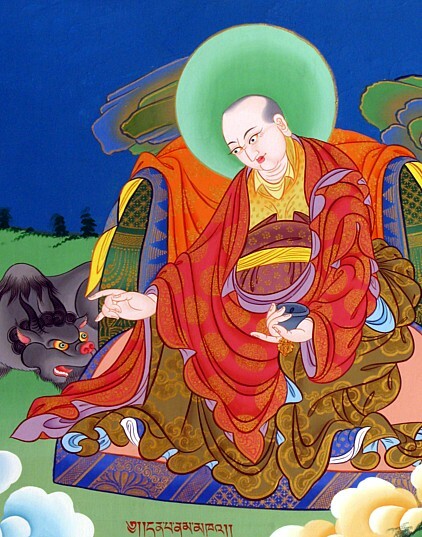 Indragarbha) — one of the twenty-five disciples of Guru Rinpoche. Later Buddhist and Bön traditions claim Drenpa Namkha to be a significant master for their respective lineages. However, the accounts of his life-story differ greatly. According to Buddhist sources Drenpa Namkha, also known as Phungbön Gomar (Wyl. Phung bon mGo dmar) and Kyerpön Chenpo, was initially an accomplished Bön priest who converted to Buddhism. Later, he became one of the twenty-five disciples of Padmasambhava. Drenpa Namkha is given credit for organizing scriptures of the Dzogchen Semde and for spreading Padmasambhava’s teachings. Bön sources claim Drenpa Namkha to be an important lineage holder, born in the eight century in Khyunglung Ngulkhar (Wyl. khyung lung dngul mkhar). Drenpa Namkha is considered to be the father of the two important Bön teachers Tsewang Rigdzin (Wyl. Tshe dbang Rig 'dzin) and Pema Tongdrol (Wyl. Pad+ma Thong grol). Bön sources acknowledge Drenpa Namkha's conversion to Buddhism, however claim it to be a skilful means, as to uphold the Bön tradition, that was believed to be persecuted at the time. Drenpa Namkha is believed to be the author of several terma treasures that were later revealed by various tertöns. Drenpa Namkha also worked as a translator for two texts (D 1671 & D 1672), both of which are ritual manuals for the Sarvabuddhasamayoga (Skt. Sarvabuddhasamāyoga). For these translations he worked together with the Indian scholars Gulendragupta (on D 1671) and Anandagarbha (on D 1672). ↑ Tulku Thondup, Masters of Meditation and Miracles: Lives of the Great Buddhist Masters of India and Tibet, (Boston: Shambhala, 2014): 107. ↑ Mandelbaum, Arthur. “Drenpa Namkha”. Published in Aug 2007 on Treasury of Lives. ↑ The Sarvabuddhasamayoga is an important Mahayoga Tantra. This page was last edited on 17 August 2017, at 05:15.